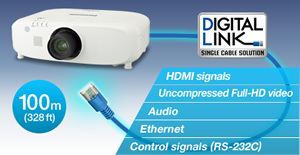 DIGITAL LINK Translits Digital Signals up to 100m (328ft) with a single cable. Equipped with a DIGITAL LINK terminal, the PT-EZ770 Series allows transmission of HDMI, uncompressed HD digital video, audio and control signals (Ethernet, RS-232C) for up to 100 meters (328 feet) through a single CAT5e (STP) cable or higher. This simplifies cabling and system upgrades, making it ideal for ceiling-mounted and other permanent installations. * Input selection and other ET-YFB100G operations can be performed only when connecting to a DIGITAL LINK compatible projector. The wide adjustment range of the powered horizontal/vertical lens shift function assures convenience and versatility during installation. It lets you easily make adjustments with the remote control. The unit can also be rotated 360 degrees vertically. This means you can install it at any angle you want, to accommodate different installation conditions. throw lenses for rear projection use. The additional lenses make it easy to adapt your projector to the installation site. The lenses attach and detach with one-touch ease. The LAN terminal allows a computer connected to the network to use Crestron Connected™ application software to manage and control system devices. Besides, the AMX Device Discovery technology is built in the PT-EZ770 Series. All you need to do is designate four points as the corners of the projected image, and this function easily carries out horizontal and vertical keystone correction. The serial terminal (RS-232C) has an Emulate function that lets you continue using existing control systems when replacing previous Panasonic models. It is also possible to output audio during Standby mode. This is convenient when connecting an external audio system through the projector. * Supports YPBPR (YCBCR) signals. The PT-EZ770 Series projectors feature a high-output 10-watt monaural speaker that produces a large sound volume without requiring external speakers. Two different image sources can be simultaneously displayed onto a single screen. You can also switch to P-in-P (Picture-in-Picture) mode and display a sub-window onto the main screen. The sub-window can be positioned anywhere on the screen for more flexible and effective image presentations. You can change the default Panasonic start up logo to any logo you want. A new logo can be easily uploaded by connecting a computer to the PT-EZ770 Series through the LAN or serial connection by using the Logo Transfer Software*. An abundance of other security measures are also included, such as a security bar, Key lock, and Security Password. This is very effective for preventing theft. * Still images that can be uploaded are limited to 1024 x 768 pixel bitmap files. Also, the application will reduce the number of colors to 191. The cabinet is designed with a straight airflow path, from intake to exhaust. The shielding of the lens section, where dust is likely to enter, has been further improved to keep dust out. And the sealing performance of the air filter unit and air intake duct has been increased to prevent the entry of dust from the filter periphery, resulting in a highly dust-resistant structure. The Eco Filter unit, which efficiently captures dust in the intake airflow path, requires no replacement for up to15,000 hours. * This large, pleated Micro Cut Filter (electrostatic filter) uses an ion effect to trap minute dust particles, further raising the overall dust-trapping capability. These features minimize the entry of dust into the optical block and maintain brightness over a long period of time, while reducing the hassle of maintenance. Also, in addition to achieving a long replacement cycle, the Eco Filter can be washed with water** and reused as an environmental consideration. * The usage environment affects the duration of the filter. ** When washing with water, please follow the procedures listed in the operating instructions. Also, we recommend replacing the filter with a new one after it has been washed and reused twice. If the filter is not sufficiently clean after washing, replace it with a new one. This helps to lower operating costs by providing longer usage between lamp replacements. * This is the maximum value when the lamp power is set to Eco2. Increases in the lamp on cycle or extended use with the lamp continuously turned on will shorten the lamp replacement cycle. When the lamp power is set to Eco1, the lamp replacement cycle is 4,000 hours and 3,000 hours when setting to Normal. The usage environment affects the lamp replacement cycle. When the lamp power is set to Auto, the Intelligent Lamp Control system automatically adjusts the lamp output in accordance with the brightness of the projected image and reduces it by up to 58 %*. It also combines with color shift correction, which corrects the shift in the color balance that occurs when the lamp output drops. As a result, power consumption is effectively reduced while excellent color reproduction is maintained. * With the lamp power set to Auto. A number of functions are provided to reduce power consumption. They adjust the brightness according to ambient light conditions, and reduce the lamp power when there is no signal input. You can easily set the Eco Management functions according to operating conditions by using the ECO button on the remote control. For easy maintenance, you can replace the filter from the side and the lamp from the top of the projector. The filter and lamp are easily replaced even after the projector is installed on the ceiling. The quiet design keeps noise levels down to 29 dB,* so the sound of the cooling fan is hardly noticeable. This helps the audience to keep their attention on the speech when someone is giving a presentation or on the screen images during quiet scenes. * With the lamp power set to Eco2. 31 dB with lamp power set to Eco1. 37 dB with lamp power set to Normal.